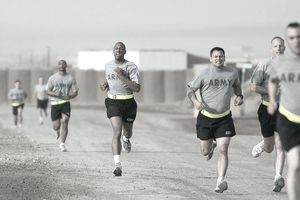 The U.S. Army measures physical aptitude through the Army Physical Fitness Test, or APFT, which requires soldiers to complete three events: two minutes of push-ups, two minutes of sit-ups, and a two-mile run. Scoring on the APFT is based on age category, gender, number of repetitions performed of the push-up and sit-up, and runtime. The score for each event ranges from 0 to 100 points. Soldiers need to score at least a 60 to pass the test. APFT standards may be tougher for some special purpose units. Scores of 270 or above on the APFT—with a minimum score of 90 in each event—earn soldiers the Physical Fitness badge. However, this test has been widely criticized for not adequately measuring strength and endurance. For this reason, in 2011 the Army piloted the Army Physical Readiness Test (APRT) on more than 10,000 soldiers but eventually decided to stick with the APFT test. While the APFT test is still being used, the following charts show the number of repetitions and scores needed for men ages 42 to 46 to pass the test. Standards vary by age and gender, and the standards have been criticized due to the differences in passing scores for men and women. While the U.S. Army is in the process of rolling out gender-neutral fitness tests, there is a plan in place to add women into previously closed military occupational specialties. But as it stands at the writing of this article, gender-neutral tests still need Defense Department approval. According to the U.S. Army, new tests being developed will likely incorporate exercises that soldiers will need on the battlefield, that will revolve around gender-neutral and standards-based skills. The Occupational Physical Assessment Test (OPAT) is a gender-neutral test that includes a standing long jump, a deadlift, aerobic interval run, and “seated power throw,” which is "a gauge of upper-body strength that represents loading ammunition," according to Army Times. Scoring for each event has yet to be determined, but unlike the APFT, plans call for one system for all ages and genders. MOSs will be ranked in a three-tier system. Recruits with scores that fall short of Tier 1 (high-demand) in a given event, won’t be eligible for specialties in that tier. Recruits must meet the Tier 3 standards to join the Army. Re-tests will be allowed with time frames and limits to the number of tests to be determined. Like the APFT, the OPAT can be administered individually or in a group setting. Could You Pass a US Military Fitness Test?